Flap, a photo by aghrivaine on Flickr. This is the cover flap in progress for the manliest diaper-bag ever. 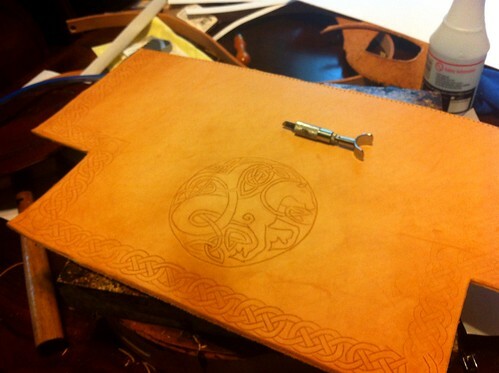 It will be a leather portmanteau, covered in celtic scrollwork, with a seahorse celtic knot in the middle. The interior compartment will be lined in scarlet-dyed calfskin, and the sides will have secret compartments containing; pipe, tobacco, tools, money-clip, flask of scotch, knife, and a copy of Hemmingway. It will be dyed a pleasing light brown color, antiqued to bring out the scrollwork, and thoroughly protected against water and other stains. Love that Celtic seahorse! The scotch and copy of Hemmingway will be the perfect accessories, lol.